CAMP test is used for the presumptive identification of Group B beta-hemolytic streptococci, Streptococcus agalactiae. CAMP test is effective for the “prompt and reliable” identification of Streptococcus agalactiae in the clinical lab as results could be observed in as little as 18 hours and required few manipulations.CAMP test rarely give false positives with other Streptococcus. The hemolytic phenomenon was first described in 1944 by Christie, Atkins, and Munch-Petersen, and CAMP test is an acronym of their names. The hemolytic activity of the beta-hemolysin produced by most strains of Staphylococcus aureus is enhanced by extracellular protein produced by group B streptococci. Interaction of the beta-hemolysin with this factor causes “synergistic hemolysis,” which is easily observed on a blood agar plate. 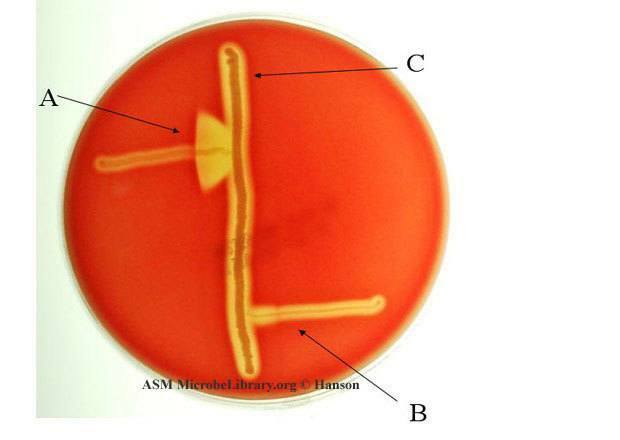 This phenomenon is seen with both hemolytic and non-hemolytic isolates of group B streptococci. Down the center of a blood agar plate (trypticase soy agar +5% sheep blood), make a single straight line streak of beta-hemolysin producing Staphylococcus aureus, taking care not to intersect the staphylococcal streak, inoculate a streak of the beta-hemolytic streptococcus to be identified perpendicular to the staphylococcal streak. Make these streaks in such a way that, after incubation, the growth of the two organisms will not be touching. The streptococcal streak should be 3 to 4 cm long. Known group A and B streptococcal strains should be similarly inoculated on the same plate as negative and positive controls respectively. The area of increased hemolysis occurs where the beta hemolysin secreted by the staphylococcus and the CAMP factor secreted by the group B streptococcus intersect (See the figure ). Any bacitracin-resistant, trimethoprim-sulfomethoxazole-resistant, CAMP test-positive, Beta-hemolytic streptococcus can be reported as beta-hemolytic streptococcus, presumptive group B by CAMP test. Some group A streptococcal will be CAMP test positive if the test plate is incubated in a candle jar, in a CO2 atmosphere, or under anaerobic conditions. Therefore, ambient air incubation should be used. THANKS ITS VERY HELPFUL FOR ME. Hello sir. ; what other organisms apart from grp A streptococcus give CAMP positive? What is reverse CAMP test ? Hello Dr Acharya, I am glad to inform you that the above picture appeared in the Final FRCPath part2 Medical Microbiology Autumn 2018 practicals exam held on 11/10/2018. Candiates were asked to identify A,B and C, Principles of this test and interpretation of the result.